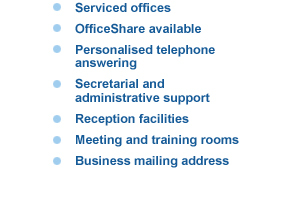 Bathgate Business Centre provides flexible and fully operational quality Office Accommodation. Whether you want cellular or open plan, serviced or un-serviced, the choice is yours – we tailor our facilities and services to meet your requirements. We have a variety of fully furnished offices immediately available with flexible terms and competitive rates from single to multiple occupancy. Services available to all businesses include Personalised Telephone Answering and Reception Facilities , Secretarial and Administrative Support, Franking, Photocopying and Faxing.